PLS6.75 Laser Platform The PLS6.75 is a free-standing platform designed and engineered for light manufacturing operations and batch production. The PLS6.75 can accept all Universal laser cartridges for a power range of 10-75 watts. The PLS6.75 offers a material processing envelope of 32" x 18" x 9", 5,184 in3 (813 x 457 x 229mm, 84,950 cm3) and is particularly suited for manufacturing and production environments. There are also a number of patented Uniquely Universal features designed specifically to expand your processing capabilities that are only available from Universal Laser Systems. Laser Interface+™ and Rapid Reconfiguration™ are standard Uniquely Universal features on the PLS6.75, and a number of additional options are available to enhance your laser processing capabilities. All Universal laser platforms use interchangeable components, giving you the ability to tailor your system to fit your needs. The PLS6.75 is a free-standing platform designed and engineered for light manufacturing operations and batch production. The PLS6.75 can accept all Universal laser cartridges for a power range of 10-75 watts. The PLS6.75 offers a material processing envelope of 32" x 18" x 9", 5,184 in3 (813 x 457 x 229mm, 84,950 cm3) and is particularly suited for manufacturing and production environments. 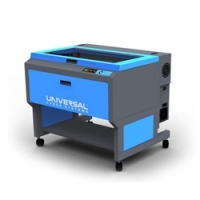 There are also a number of patented Uniquely Universal features designed specifically to expand your processing capabilities that are only available from Universal Laser Systems. Laser Interface+™ and Rapid Reconfiguration™ are standard Uniquely Universal features on the PLS6.75, and a number of additional options are available to enhance your laser processing capabilities. All Universal laser platforms use interchangeable components, giving you the ability to tailor your system to fit your needs. Computer Requirementsl Requires a dedicated PC to operate. Compatible with Windows XP/Vista/7 32/64 bit.